Palgrove has bred stud Charolais cattle since 1969 and in 2009 became one of the first breeding operations to pioneer the development of tropically adapted Ultrablack cattle. Picture: Palgrove. THE Palgrove cattle operation developed over the past 30 years by Prue and David Bondfield at Dalveen in Southern Queensland today includes 8000 registered seedstock cattle, 1200 commercial cows, 20,000 hectares across nine properties from northern New South Wales to Central Queensland, a staff of 22 and a genetics client base spanning not only most of Australia, but also several countries overseas. 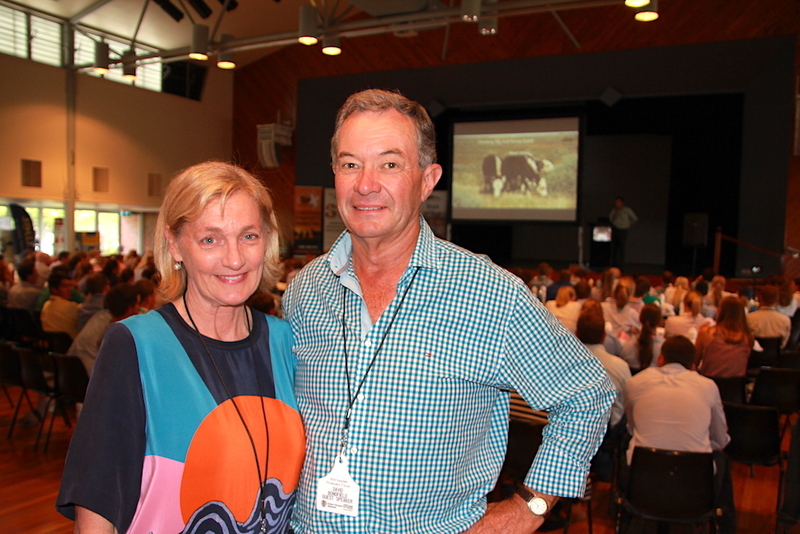 Prue and David Bondfield at the 2018 Young Beef Producers Forum in Roma. When Prue and David started out on their own 30 years ago, they had 50 cows, 500 sheep, 300 hectares, zero staff, ‘quite a bit of debt’ and lots of ideas. And, it’s worth noting, they also faced interest rates soaring at a daunting 19 percent. 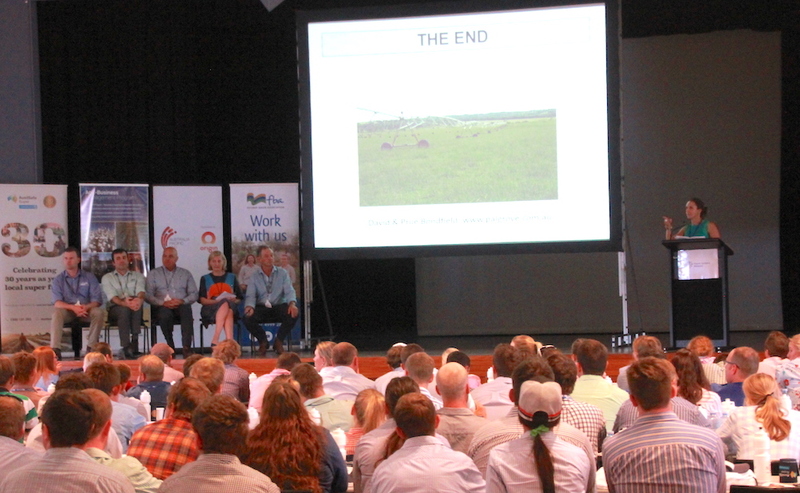 Yesterday at the Young Beef Producers Forum in Roma the Bondfields shared the story of their businesses’ growth and several lessons they have learned along the way with a room full of cattle producers, many of a similar age as David and Prue were when they started out themselves. “These are some of the things I wish someone told us (when we started), because it takes a lot of effort and a lot of mistakes to find these things out,” Prue said. “I grew up in an era where you had to own the land that you lived off, and that very much limited the size or the growth of the business that you had for the rest of your life,” David explained. “So whether it was one hectare or several thousands of hectares, you operated that and that was your business. “We knew, and we’ve proved, that for every dollar we invest in cattle or genetics, we can make four times the amount of profit from that than if we invested that dollar on land. “So rather than early on spending too much money on land and going forward, we leased, agisted and share-farmed land to build up our cattle numbers, and along the way we bought land strategically. “…We certainly bought land when we could and how we could, but we only purchased the land from the income we’d earned from our cattle business. 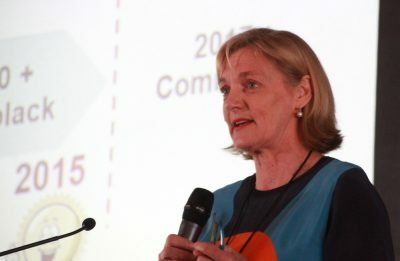 The Bondfields said they always been actively involved in research and development opportunities through Meat & Livestock Australia, the Cooperative Research Centre Programs, breed societies and other organisations, and have taken on industry and board roles throughout their career in agriculture. 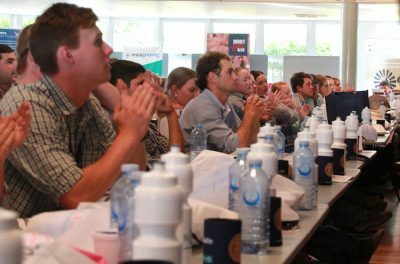 Rather than sitting back with a ‘wait for it to happen’ attitude, David urged young producers to adopt a ‘make it happen’ mindset. “Everything we do at Palgrove as a seedstock cattle producers is about our customer,” David said. “Our genetics as seedstock producers will influence every part of the beef supply chain. If we’re selling bulls to the commercial cattleman, they’re interested in fertility and fast growth and constitution and so forth. “If a commercial breeder then sells onto a feedlotter or grass finisher, those guys are interested in net feed efficiency and the right amount of even fat cover and maximum daily gain. “They sell onto the processor, and the processors’ profit comes from yield, carcase weight, fat cover and so forth, and then ultimately onto the consumer who is influenced by eating quality, marbling, tenderness and all of those traits. “So the genetics from our business will flow right through that supply chain. It is our customers and their customers and their customers who ultimately drive our business. “So simply put, no matter what your business is, if you don’t have happy customers, you definitely won’t have a business. Being open minded and prepared to adopt flexible, innovative ways to fund the growth of their business has also been a hallmark of the Bondfield’s business journey. A few years ago, David said they felt frustrated that they may be missing opportunities because they did not have the capital to act on them and did not want to borrow further and debt fund that growth. 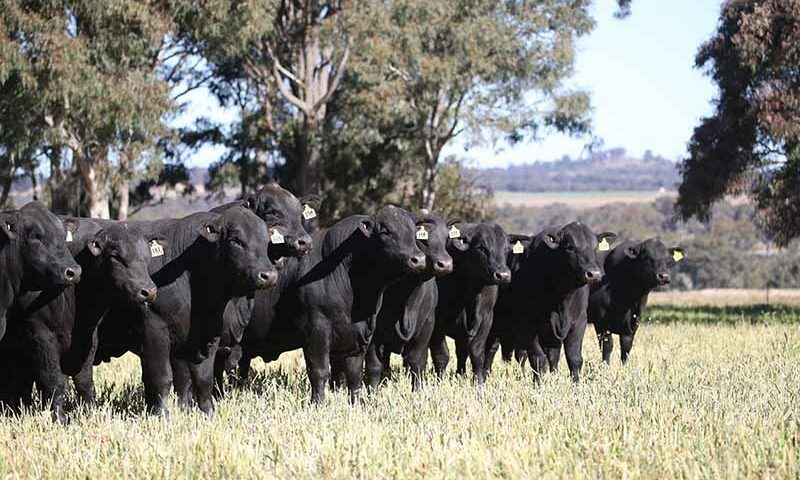 “We were still a 100 percent stud cattle seedstock business, but we had envisaged running a commercial beef cattle herd, largely for the reason of doing our own research and development on our new Ultrablack genetics. “This led us in 2017 to forming a significant joint venture partnership with the New Zealand Superannuation Fund. “It is quite a unique partnership or joint venture, it is a hybrid family corporate model, and it is working really well. Proactive succession planning enabled Prue and David to start their own business early in their marriage and they have also made a point of talking openly with their three children to prepare for the future. Prue said attending a 1999 Rabobank executive development program had been “a life changing event” for the couple. “We were put in a room with wine people and cotton people and grain growers and public companies and family businesses and all just thrown in together,” she recalled. “I was a little bit scared, our turnover was fairly minimal back then, and I thought how embarrassing, I am going to have to talk in front of all these people, but I found it was the most incredible learning experience. “On the way home in the plane I got my boarding pass and wrote on that boarding pass a strategic plan for the next five years and that plan changed who Palgrove is and what it is. One of the lessons they had learned over the years, Prue explained, was the importance of embracing learning opportunities. “Going to an accountant to get business advice is about the best thing you can do,” Prue said. Prue said a key learning she took away from the Rabobank educational program was to do something that “makes you feel really uncomfortable”. “Talk to someone who you don’t know, who is not in your tribe, because your will find out a lot more from those people than you actually will from the people who know what you know, and most of us in the beef industry feel comfortable with each other. “The huge thing we have learned over the 30 years in business that David and I have been together is that our people in the business are just the most important thing that we have,” Prue said. “If you don’t have a good workforce that is committed, engaged, and that wants to be there… you can’t have a business. Prue said the business has just put in place a program where people who work for them in roles such as station hands can spend a day every fortnight or so in the office learning how the business operates. “It is really important that employees understand how your business works and what it does and what drives it,” she explained. “That team work and relationship in the business is really important. We like to think now we have careers and not just jobs. With agriculture being continually bombarded by negative commentary from activist groups, it was important for individuals within agriculture to stand up and tell the right story. “Don’t be afraid, if a whole lot of individuals tell a story the story gets told,” Prue said. I first met Bondy at the EKKA about 1981 (pre Prue I reckon!) at the National Junior Judging titles. He was selling a few Charolais bulls at the time privately, but said he had plans to hold his own sale within a few years. Ambitious I thought – Charolais were not as prominent as they are today – but he definitely made me think he would make it happen. Vision, hard work, integrity and attention to detail has the Palgrove brand as Australia’s number 1. Well done Bondy and Prue. Great advice from two great people who have made their own success and are prepared to share their story with a new generation of agricultural business people. Excellent business strategy, in full agreement with your business plan. Thanks for sharing your experience’s with the broader community. This is a model that applies to every business success story. I personally would encourage everyone who reads this article to take it on & believe in it. Well done David & Prue.